What's the real dirt on this "miracle" cleaner? Quilters recommend it all the time. But what makes Orvus so special for laundering quilts? Is it really the only thing you can wash your quilts with? Isn't my everyday detergent good enough? On this page you'll learn what it's made from, the things to watch out for and finally information on how much and how to use this quilt soap for washing your own patchwork. Responses to reader's questions are at the bottom of the page for your review. Optical brighteners which are really poor washfast fluorescent dyes (that means they wash out easily) that transform invisible ultraviolet light to make fabric colors appear brighter. One of its best features is that you know exactly what is and isn't in Orvus. Though similar chemically, detergents and soaps are different. Soaps are made from animal or vegetable fat and oils which are then mixed with a strong alkali. Detergents are created from petro-chemicals. 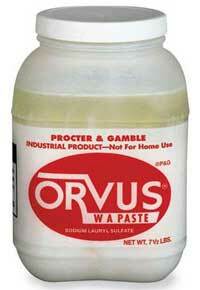 Commonly used as a horse shampoo, Orvus is available at livestock supply stores. Regardless of where you find it, a Farm and Fleet or your LQS, or what it's called, "horse shampoo" or "quilt soap", it's all the same stuff. It's just much less expensive in larger quantities. Hard water (the presence of increased amounts of calcium or magnesium ions in your water) may reduce it's cleaning power AND make it harder to rinse out. SLS is a strong skin irritant. It can cause allergic reactions. Use a spoon to scoop out the concentrate. If you happen to get the "flake" form, use a mask and gloves when handling it. It lacks "surfactants" in its formula. Surfactants act to keep dirt, grease and grim suspended in the water so they don't redeposit on your patchwork. Dawn Dishwashing Liquid is a surfactant that keeps the grease in the water and away from the dishes. Synthrapol is a detergent/surfactant used in the hand dyeing process to keep unattached Procion MX dye molecules suspended in the water. Don't use vinegar in the wash or rinse with this product. Quilters will sometimes use vinegar in an attempt to set colors. Adding vinegar can reduce the wash water's pH down to a point where the sodium lauryl sulfate (SLS) bonds with the fibers themselves. You will not be able to get the SLS out and it will attract dirt to your quilt. Does this mean you shouldn't use it for washing quilts? 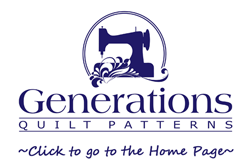 These are things, that as a quilter, you should be aware of as you use products on quilts that you have spent a lot of your time and hard-earned money making. Be informed. So what should you use to wash quilts? Choose a liquid detergent with a neutral pH without bleaches, optical whiteners, fabric softeners, enzymes and fragrances. And Orvus is exactly that. Regardless of your choice, just follow general safety precautions. It's that simple. How much Orvus do I need? This stuff is highly concentrated. It'll take just a tablespoon per washload. Don't get it on your skin, it's an irritant. If you get the flake version, use gloves and a mask. How much does it take to wash a quilt in the washing machine? This is where less is more. Orvus is concentrated so do pay close attention to the directions that come on the bottle or jar. You won't need more than a tablespoon of this cleaner per wash load. Sometimes it'll be 'goopy' coming out of the container. If that's the case, stir it into a glass of cool water until it was fully dissolved. That way it's easier to disperse throughout the entire washing machine tub full of water. If you plan to use your local laundromat, one word of caution. First run a load of towels or something else through the washing machine you'll use. I had a gal tell me about how she'd run a quilt through at the laundromat and it ended up all spotted. The person who used the machine before had used bleach and there were 'leftovers' in the machine. I wouldn't want that to happen to you and your hard work! How much Orvus Paste should I use to wash a king size quilt? 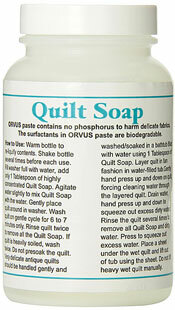 Even when Orvus is sold in your local quilt store as "Quilt Soap", this stuff is concentrated! So even if you're washing a king size quilt, you'll still need no more than a tablespoon of Orvus added to your washing machine. Full instructions are included here at "How to Wash A Quilt Safely". If you didn't test for bleeding fabrics before you constructed your quilt, please do it before you wash it. One of my bee friends has been working on an applique quilt for over year, full of hand appliqued circles. Destined to become a treasured heirloom. Unfortunately (an understatement!) during the process of washing out the Elmer's glue used in the hand applique technique she used, several of the fabrics have run. These red fabrics were all pre-washed. All quilt store purchases. As she has removed and replace some circles and rewashed, other fabrics have bled. There is a huge amount of time invested in this quilt, and I'm sure she will finish it. But it hurts to watch her remove and replace circles, only to have other fabrics bleed. I would not want that to happen to you, or anyone else. Use the washing machine more as a convenient laundry tub than for its agitation. A wet quilt is a heavy quilt and the agitation from your washing machine can add considerable strain to your stitches. Rather soak your quilt in the machine and use the spin feature to remove the water.